MarshLink Action Group (MLAG) hosted a packed public meeting at Rye Town Hall on Thursday, November 29. Mr Hutchinson outlined the multiple reasons why the service had become so bad and highlighted recent cases of vandalism with trains being damaged by stones being thrown at them in the Ore area. He told the meeting that the trains are at ‘mid-life’ and need more and regular maintenance, much of which cannot be done locally so the trains need to travel up to Selhurst depot in South-East London. 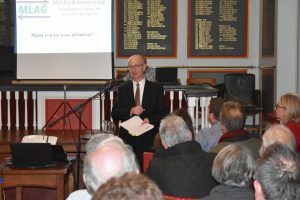 He informed the group that they are continuing to analyse the causes of the cancelled trains and looking for ways that different parts of the network could work better together to avoid cancellations and the late running of the service. Following the inexcusable cases of people being left stranded at Rye station last summer due to overcrowded trains, he took the opportunity to announce that they are investigating laying on longer trains for special occasions next summer and the possibility of additional services at weekends through-out the summer months. 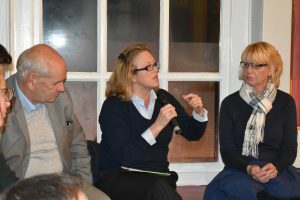 Around 70 people attended including Keith Glazier, leader of East Sussex County Council, Sally Ann Hart, Rother District Council’s lead on culture and tourism development, Lord Ampthill, one of Rye’s two representatives on Rother District Council, Michael Boyd, mayor of Rye and Barry Blakelock, head teacher of the Rye Academy. All stressed the need for a reliable service – whether to encourage visitors to come to the area and boost the local economy or just getting kids to school on time. Next week we’ll report on the High Speed debate – yes, a debate. If the service should ever operate in the future, not everyone wants a High Speed service to stop at Rye. – a willingness to listen to so-called commuter groups which results in a timetable change that totally ruins real commuting, putting reliance on the consistently bad shuttle. Commuting is not toddling off to Hastings a couple of times a week for coffee with a friend. Other readers may wish to add to the list.